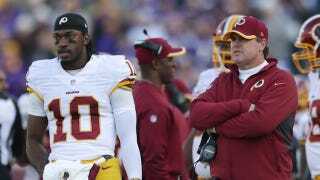 Washington coach Jay Gruden could be out of a job after this season because of his desire to part ways with Robert Griffin III, according to Jason Reid of The Washington Post. Although it's unknown whether Snyder and Allen eventually will agree to trade Griffin, what has become clear from recent conversations with Redskins officials is that Gruden believes he needs a clean break from Griffin to focus on fixing Washington's 3-9 mess. And if Snyder and Allen commit to Griffin as the starter in 2015, Gruden could be "one and done," a team official said, alluding to Gruden possibly being fired despite four years remaining on his guaranteed five-year contract. To Gruden, Griffin seemed more concerned about enhancing his brand than about honing his pocket skills. Often, Gruden rolled his eyes after being informed about the life lessons the 24-year-old offered on social media. Gruden became frustrated that Griffin, even after Gruden benched him, failed to acknowledge his role in his failure. So we have a report that says Griffin may start, a report that says Griffin's coach wants him off the team and a report that says Griffin's coach may be fired if he doesn't try to keep him on the team. Somehow, I don't see this ending well for the organization.